You also get two options related to wireless remote control shooting and Quiet Shutter mode, which dampens the normal shutter-release sounds. 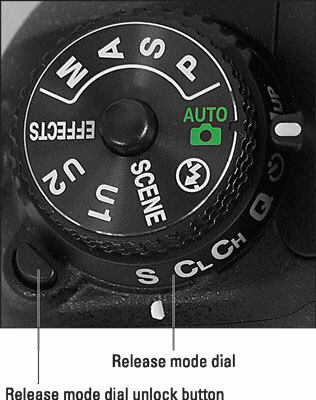 The primary point of control for shutter release is the Release mode dial. To change the setting, press and hold the Release mode dial unlock button (labeled in the figure) while rotating the dial. The letter displayed next to the white marker represents the selected setting. For example, in Figure 2-4, the S is aligned with the marker, showing that the Single Frame mode is selected. You can choose from a variety of Release modes. This symbol represents the current Release mode. One note in advance: If you’ve worked with another Nikon dSLR with a Release mode dial, you may expect to find a dial setting designed for use with the wireless ML-L3 remote control unit. 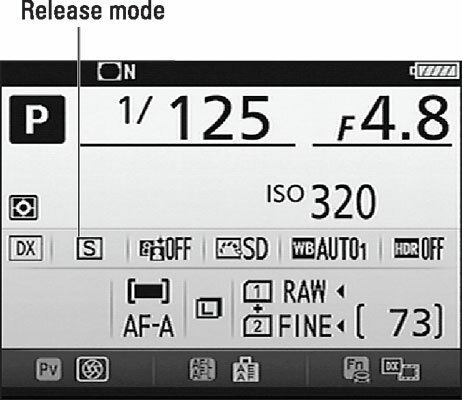 But on the D7200, you instead enable wireless remote shooting via the Remote Control Mode (ML-L3) option on the Photo Shooting menu.